Full-matrix self cross-linking technology makes this ultra-rapid curing finish highly durable. There’s no sanding, catalyst or messy glues. Because it’s a single-component finish, you just pour and go. You can play on it the next day and it’s good for a year with proper maintenance. 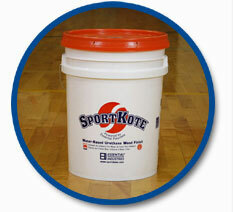 500 million square feet of wood floor finished with Sport Kote says it all! 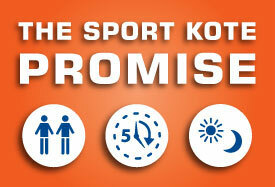 Sport Kote is part of the Sport Kote System. PREPARE FLOOR: NOTE: This finish is not designed for application to bare wood floors. Use only on previously sealed surfaces. Use only after proper training. Weight per Gallon – 8.70 Lbs. Lawrence Township Schools- “Our school system has used Essential’s Sport Kote on all of our 20 plus gyms for over 10 years. It's the best gym finish we have ever used. It holds up great all year long..."
Rosati Kain High School- "It's the best our floor has ever looked. The prep and coating was very easy to do, and my gym was only down for 1 day..."
Athens Area School District- "This letter is to let you know how pleased I am with Essential Industries Sport Kote gymnasium finish..."
St. Louis School Districts- “I love the ease of use and prep time. I can coat multiple floors in one day with my crew. I know the floor will be perfect the next day...."
Four Lakes Athletic Club- “I wanted to thank you with helping Four Lakes Athletic Club with rejuvenating our Gym Floor. Sport Kote was exactly what we needed..."
Canajoharie Central School District- “I just wanted to let you know that now after basketball season our gym floors still look good..."
St. Lorenz Lutheran School- "St. Lorenz has been using the Sport Kote product for our gymnasium for over the past 10 years. 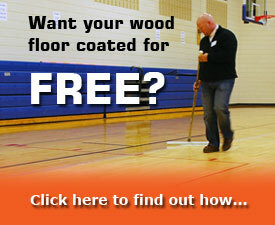 It has proved to be an outstanding product that has preserved the quality and life of our wood floor. It is easy to apply, dries quickly so a second coat can be applied shortly, and there is no odor..."
Blessed Sacrament School- "We recoated our gym floor with Sport Kote in August. Since the school year has started, the gym is used for several hours during the day and volleyball in the evenings. The floor has had a tremendous shine..."
Clarksville Middle School- "This letter is to thank Essential Industries and Allied Cleaning Solutions for their professional and informative work in applying Sport Kote Finish to our middle school gym floor. Our floor had not been finished in almost 7 years..."